I must admit, when Ryan Grant ran for a touchdown on the first play from scrimmage yesterday, I thought it would be an easy win for the Green Bay Packers. Not so. The Chicago Bears were a tougher opponent than I thought. Ticket King Milwaukee fans love our Green Bay Packers. Just because we sell tickets, doesn't mean that we are not fans. We love our Milwaukee Brewers, Wisconsin Badgers, Milwaukee Admirals at the Bradley Center, and just about any team that plays here in the great state of Wisconsin. 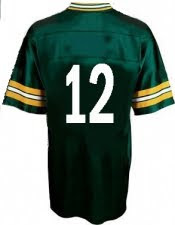 At 9-4, I don't quite want to call it a Green Bay Packers playoff lock, but it's getting closer to a reality. Let's see what our Packers do in Pittsburgh next Sunday. If they make 10-4, I'll be ready to cheer them on in the NFL playoffs.